​When many people think of a lemon, they think “sour”; yet when many people think of cool lemonade, they think “refreshing”. Much of what we experience in life is about our associations. To a dog, his association with a stick can be either positive or negative based on that dog’s previous history with it: if the dog was beaten by a stick, he will be fearful and sulk away at the sight of it, however if the dog’s owner usually plays fetch with that stick, the dog may get excited and know it’s time to play. I had my corgi, Scout, before I had my husband, Rick. The first time Rick came over to my house, we were sitting on the couch watching television after dinner, Scout laying at our feet chewing on a bone. When Scout saw me get up about 9:00 to get a drink from the kitchen, he enthusiastically, without being asked, left his spot on the floor and hurried off to the next room to put himself in his crate. Confused, Rick asked, “Maria, what is your dog doing?” I peeked out from the kitchen and said Scout was putting himself to bed, that he understands this is usually his bedtime. I returned to the couch and left Scout where he was. Scout laid in his crate watching us with the door open for about 5 minutes before he came back out and sat right in front of me, looking at me as if to say, “Mom, you forgot something – you’re supposed to close me in my kennel for bedtime.” When I asked, “What do you want, Scout?”, again he enthusiastically went over to his crate and plopped down inside. Rick was floored. “I don’t get it,” he said. “What dog would willingly want to be closed in his crate?” I explained to Rick that it’s all about associations. From the time I first brought Scout home as a pup, I taught him that being in the crate was a good place to be. When he would go in, it was like a party - he would get treats and special toys he wouldn’t have access to otherwise. I would practice crating him not only when I left for long periods of time, but also for many short time periods – even 15 minutes here or there – both when I walked outside and when I was still in the house doing something in the other room. If I was home, I would pop in periodically to toss in a few extra treats to him without giving him much attention – they were like “pennies from Heaven” in his mind. It didn’t take long for Scout to WANT to go into his crate, and he even looked forward to me leaving him alone! I was creating not only a more confident pup but also a more independent pup as well – one that didn’t need to be with me every second of every day, since that’s not very realistic anyway (as much as I would love to spend all day with him if I could!). There are also many other areas of our dogs’ lives where associations play an important role. For example, how he deals with people, other dogs (either close or at a distance), inanimate objects (such as statues or balloons), animated objects (like kids toys), noises (like a lawn mower or fireworks), and the list goes on and on. Part of creating a confident and happy canine companion is making as many positive associations as possible. If you take the experience, object, etc. (we’ll just call these “triggers”, since they then trigger an emotional response) that a dog isn’t so fond of, and you pair it with many of the great things life has to offer, he’ll soon start to realize that this trigger isn’t as bad as he originally thought. Eventually, he may even grow to enjoy the trigger when he finds out how rewarding it can be! This method is referred to as counter-conditioning. In my mind, the most important things to consider when creating these positive associations are timing, the value of the reward, the rate of reinforcement, and the amount of pressure. Initially, it will be important that the reward system is delivered immediately in the presence of the trigger, ideally before the dog reacts with an emotional response. Your reward system may vary (see “value” below) but it is best to have the reward readily available in a pocket or on a nearby counter as opposed to already in your hand. If you’re using food treats (which are a great secondary reinforcer to many dogs in addition to your praise and happy body language), I advise using small, bite-sized treats so you can be quick with the delivery of the treat (you don’t have to break it up or give your dog 10 seconds to chew on it) and you can also easily give multiple treats for a job well done. We do want to be careful not to lure or bribe the dog with the food unless absolutely necessary (see “pressure” below), as this adds pressure but is also management and doesn’t really teach the dog anything. Each dog is a little different when it comes to what things they find valuable (just like people). We don’t want to assume that something (a particular treat or toy, for example) is rewarding to your dog because he “should” like it – we actually want to ask the dog to choose and pay attention to what he finds rewarding. Maybe he prefers certain treats to others, or doesn’t have much interest in a tennis ball but loves a tug toy instead. Maybe he isn’t motivated by food at all but just wants to get love from you! It’s also important to recognize that what is rewarding or motivating in one situation may not be as rewarding or motivating in another situation if the intensity, etc. is higher. Have you ever thought about going to a party but weren’t quite sure about whether or not you wanted to go - then when you found out so-and-so was going to be there you said, “OK, I’m in!”? It works the same way with dogs. Sometimes regular treats will do, sometimes you might have to use higher value treats. Maybe a bone is interesting on its own, but maybe what’s more rewarding to your dog is a walk or playtime with you. For more information on figuring out what rewards are more valuable in which situations, see The Value Hierarchy - Navigating Your Dog's Preferences to Modify Behavior. This is basically the frequency and speed at which you hand out your reward system to your dog. At first, you might need to dole out party after party (complete with plenty of praise, treats and pets, etc.) to your dog for being in the presence of the trigger every time, whereas later on you can fade to intermittent reinforcement once the dog starts to get a good handle on things. You may have to increase your rate of reinforcement the closer you get to the trigger, and decrease the rate of reinforcement after you have passed it or once you are further away. While a little bit of pressure and stress is natural when learning, it’s important we do not hand out an unhealthy dose when trying to change a dog’s association or our efforts may backfire. Many of us learn a lot better when someone’s not forcing us to do something, and dogs respond well to this same method. ​Moral of the Story: Being able to process something without pressure, in our own time, when we connect it with something good, can go a long way in making us feel better about this something. And I have seen the same thing happen countless times with our canine friends in regards to some of their own fears as well. What if your dog get overly EXCITED around people or other dogs and has a hard time containing himself? Perhaps it’s because he insists that every guest that comes to your home is there to see HIM, or that he MUST play with every dog he comes across. 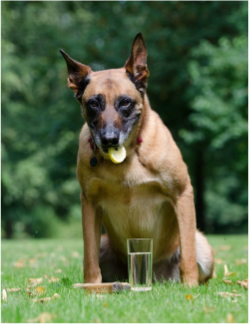 The same concepts above can help when it comes to teaching your dog how to respond appropriately around these kinds of highly stimulating triggers and practice impulse control. While your dog can still be happy to see people or other dogs, we can teach him to "take it down a notch" and learn to display better self-control in the presence of these triggers through similar counter-conditioning and desensitization techniques. It can work both ways! When your dog can have positive associations to the various things that life with humans has to offer, you can build a confident, happy and well-rounded canine companion. Your calm, passive support and lack of pressure while he works through his fears will show him that you’ve got his back, which will increase his trust in you and build your bond as well! A little love and patience definitely goes a long way! Understanding how to change these associations can be critically important in molding a confident and happy canine companion. For help in applying these concepts to your dog, contact Maria at (845) 549-0896 or maria@mghcanineconsulting.com.